Lockpath, a leading provider of integrated risk management solutions, today announced the availability of the integration between its award-winning Keylight Platform and RiskRecon, a SaaS-based third-party cyber risk monitoring solution that delivers objective insights into third-party security performance and IT landscape. This product integration aims to enable precise, efficient reduction and elimination of organizations’ most critical third party security gaps. This integration will allow joint customers to garner a more complete view of the risk posed to them by vendors, partners, suppliers and other third parties. Joint customers can use RiskRecon data within Keylight, Lockpath’s integrated risk management platform, to continuously monitor the Internet security health of vendors and third parties at scale. This brings additional insights into unseen risks introduced by third parties while enabling smarter, more informed decisions about the third-party relationship. The integration will also assist in the third-party due diligence process by supplementing internally-produced data in Keylight with validated, objective data from RiskRecon. 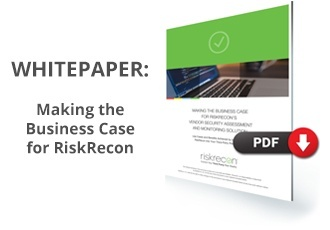 Organizations can use the data to better gauge the level of risk third parties pose to their organization, determine the frequency/depth of risk assessment needed, and prioritize risk remediation efforts accordingly. Learn more by reading the news release on Lockpath’s website!